The user can select his desired flow rate by means of a clearly structured and easy to use keypad. He can start the filling process immediately by a further keystroke and interrupt it any time. 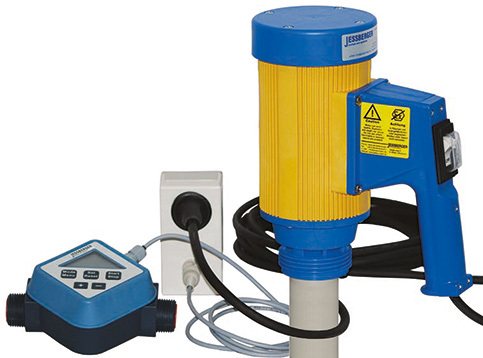 To ensures best dosing accuracy, the flowmeter can be calibrated for different media. From a fluid dynamic aspect, the minimum flow volulme is 20 liters in these turbine wheel meters. The electronics located in the white remote switch or the handle of a non-explosion-proof drum pump ensures that upon reaching the user specified delivery rate the signal output is opened and switches off the pump reliably or a magnetic valve or a ball valve is closed. JESSBERGER delivers the quantity preset option for more than ten years, in combination with its own electric drum pumps especially on chemical manufacturers and their distributors next to well-known companies in the electroplating industry. Both flowmeter FM 120 series are optimally suited due to the options of the pulse output and the quantity preset for simple and recurring filling processes.